Before 9 months little children may be eating rice cereals and soft, liquid-y foods like applesauce and pureed or mashed vegetables. Now, two signs tell you if your 9- to 12-month-old is ready for original Cheerios® cereal and other solid foods: 1) She has mastered the art of chewing (it doesn’t matter how many teeth she actually has) and 2) he can use the “pincer grasp” and can pick up small objects. You can ask the pediatrician to be sure, but most likely, children showing these signs are ready for original Cheerios cereal and other finger foods. A few generations of moms and dads have discovered original Cheerios cereal makes a great finger food; pediatricians’ expert opinions back up that parental wisdom. I grew up on Cheerios from the time I was a toddler until I was a teenager. Now, Cheerios is marketed as being heart healthy, but what about the white elephant in the room? Cheerios sold in the United States contain GMO ingredients. 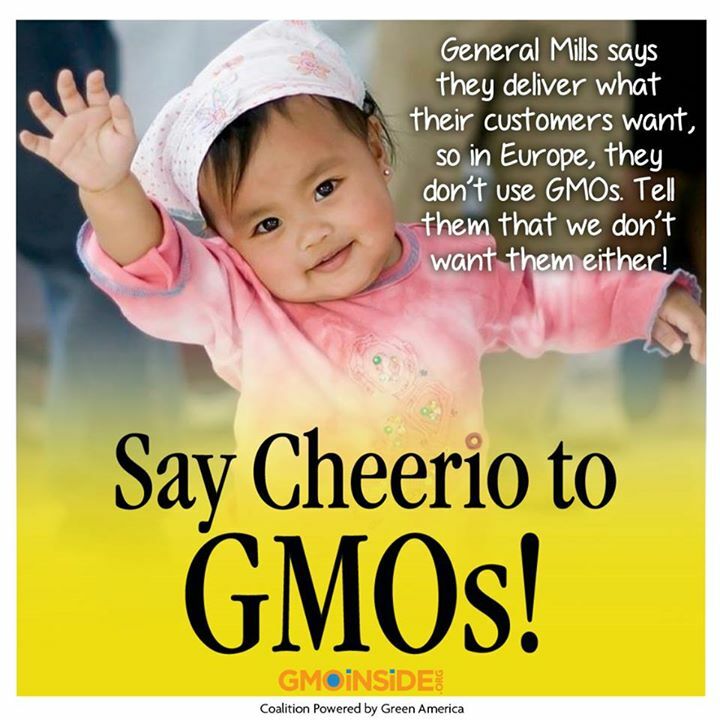 Cheerios sold in Europe are GMO-free. General Mills – the maker of the ubiquitous breakfast cereal Cheerios – prides itself on being a champion of corporate social responsibility (CSR), but it is anything but that in the United States, where it denies consumers the option of Cheerios without genetically modified organisms (GMOs), and is a major force in the corporate campaign to deny consumers information about foods containing GMOs, according to a major new report to be issued at 11 a.m. EDT on October 16, 2013 by the nonprofit Green America. Despite its refusal to do so at home, General Mills already offers GMO-free Cheerios in Europe … even as it incorrectly describes Cheerios sold in the U.S. as consisting of “natural” ingredients. To make matters worse, General Mills postures as a leader in corporate CSR, even as it pours over one million dollars into campaigns designed to prevent consumers from getting information about which food products contain GMOs. The case of Cheerios is important since it is the most widely consumed breakfast cereal in America and is often the first solid food that is fed to American babies. My children have never eaten Cheerios that I am aware of, and fortunately there are organic, gmo-free alternatives from health food companies, such as [amazon_link id=”B003ZJ2DOY” target=”_blank” ]Barbara’s Honest O’s [/amazon_link]. Barbara’s Bakery is owned by Weetabix, which does not use GMO ingredients in any of their products. They are based in the UK. There is also an organic option for cereal O’s from [amazon_link id=”B002EAN3T4″ target=”_blank” ]Cascadian Farm[/amazon_link], but they are owned by Cheerios maker General Mills. One goal at General Mills is to be among the most socially responsible food companies in the world. We continually set targets for bettering the nutritional profile of our foods, and we keep addressing social and environmental challenges. We know that some consumers remain uncomfortable with GMOs. As a global food company, we produce products without GM ingredients in some markets – we also offer organic and non-GMO alternatives in most of our major categories in the U.S. In the spirit of transparency, we’ve enrolled several products – especially our organic products – in the U.S. Non-GMO Project. We oppose state-based labeling, but we support nationally standardized labeling of non-GMO products in the U.S., where there has generally been no requirement for special labeling. I find it contradictory and confusing. Everything about GMOs is wrong from the refusal to label,the abuse of farmers who did not sign up but became “contaminated”, to the secrecy of the food corporation (Big M) and to the lack of any reliable proof that interfering with nature is good for us. As a European we don’t want it but can only say good luck with your fight in the USA. My son recently spent several months in Europe and apparently most of their foods are of the purer sort. They have less additives and preservatives. Overall, infinitely more healthful. My son noticed the difference immediately and this prompted him to do further investigation into the matter. I am aghast, but realize that the FDA regulates our food supply and it appears we here in the United States are used for experimentation albeit unwittingly.